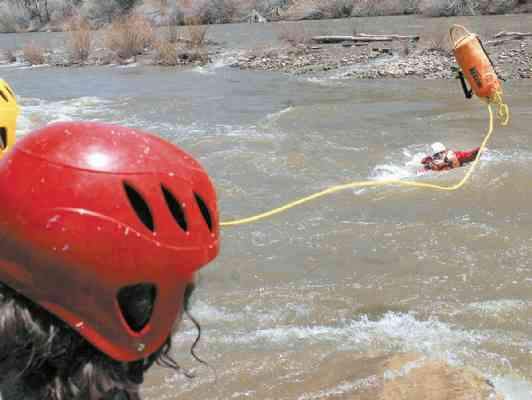 Alex Espinoza throws the rope bag to rescue Michael Morehead during the Southwest Open School whitewater rescue class on the Dolores River near Cortez recently. CORTEZ - Just before Michael Morehead plunged face-first into the 40-degree Dolores River, he thought, "There's no way I'm going to do this." But the 14-year-old Southwest Open High School student jumped anyway, immediately flipping onto his back - into "safe swimmer" mode - and allowing the current to take him down about 50 yards where classmates were waiting to draw him in. As Morehead passed through a few small rapids, teacher Brad Higinbotham gave three students standing on the river's edge a cue. A throw bag - or rescue device consisting of rope stuffed loosely into a bag - was then tossed into the river where Morehead could grab the line. The wet SWOS student was drawn in. When he got out of the river, he could only say, through chattering teeth: "Cold. Very, very cold." After warming up in the sun, Morehead said he liked the class. "It's fun, but it's hard," he said. "I'm into kayaking, too, so I've flipped in stuff like this." Seven students are in SWOS's Take Me to the River class. 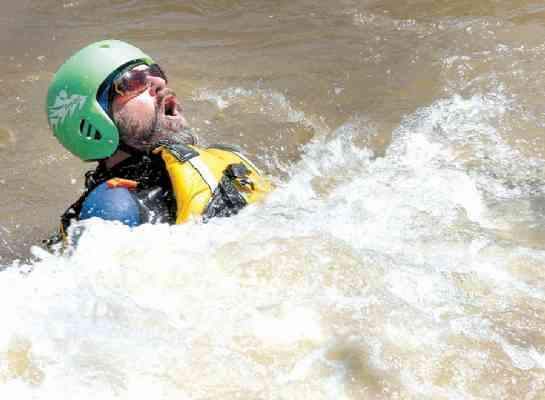 Instructors Matt Robinson and Higinbotham have been teaching students water issues and whitewater-rafting safety for eight years. "Water is a really big issue in Southwest Colorado, and we really want to foster a respect for river ecology, environment and restoration," Robinson said. "That's the most important part of this class." When students aren't taking on the chilly rapids, they're learning about geography, dams and water-use conflicts. But for the most part, Robinson said, the class "is not a passive experience." One day the class pulled a van across a parking lot to understand Z-Drag, where lines and pulleys are used to rescue pinned rafts on rocks. The recent Wednesday session was spent learning and demonstrating how to be safe in the water. Alex Espinoza, 15, who was initially worried about the cold water, was the first student to take the plunge. Afterward, he said the water was freezing and his lungs were burning, but he was eager to get back in the water. "I like this class, and I love this high school," Espinoza said. The class will eventually paddle down the Dolores and Animas rivers to start gaining experience in the river. At the end of the semester, students will take a trip down part of the Grand Canyon's western waterways, ending up in Lake Mead. Students will get to stop by Hoover Dam near Las Vegas. "Water is a really big issue in Southwest Colorado, and we really want to foster a respect for river ecology, environment and restoration."